Seeing as how the Nintendo Switch is primarily billed as a portable video game system, conservative use of power was one of the major considerations put into its design. Nintendo has said many times that players can expect three to six hours' battery life from the Switch, but they haven't revealed just how the Switch makes use of its power, be it docked or undocked, charging or otherwise. 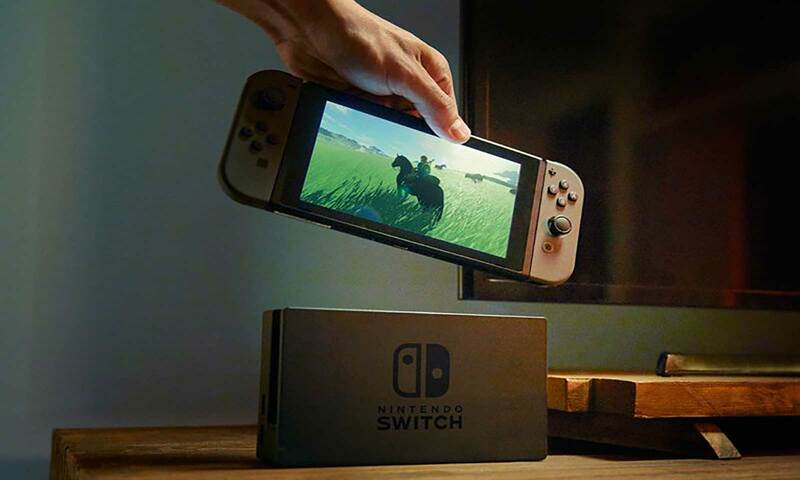 Fortunately, Ryan Smith over at AnandTech has conducted some illuminating tests and provided a comprehensive writeup for how, when, and how much power the Switch uses in various conditions. And, given the results of those tests, players can better understand how to squeeze the most life out of their Nintendo Switch, as well as discover which cables and USB power packs they'll need to keep their Switch juiced up and ready to go. These initial tests were performed with the Switch running The Legend of Zelda: Breath of the Wild while plugged into the dock, and each figure given was a result of power usage averages across 2 minutes. Though the numbers by themselves might seem irrelevant, the context for each test provides valuable insight: With the Switch fully charged, docked, and running Breath of the Wild, it drew an average of 11 watts of power — a figure that can be considered baseline performance. That number increased to 15.7W when the Switch had been previously discharged, meaning that the Switch draws an additional 4.7 watts from the AC adapter to charge itself on top of the 11W needed to run the system. Lastly, when put to sleep, the Switch drew a surprising 9.8W from the AC adapter — over twice what the Switch would use to charge while it was running. What can be gathered by that figure is that the Switch will charge much more quickly when docked and asleep — or, on the flip side, it will charge relatively slowly when both docked and awake. The Switch is predominantly a handheld, so the next logical step would be to test the system away from the dock. Fully charged and still running Breath of the Wild, the Switch drew 7.1W with the screen turned to minimum brightness. That figure increased to 8.9W with the screen on maximum brightness (specifically, from 14.8V @ 0.48A minimum to 14.8V @ 0.6A on maximum brightness), meaning the Switch's brightness setting could account for a power usage of +/- 20%. It's worth noting that these results are without the Joy-Con controllers attached; with them attached, the Switch consistently drew 8.9W, making that a rough baseline undocked performance figure. Also worth noting is that the Switch seemed to avoid charging the Joy-Cons unless the unit was also being charged; seeing as how the Joy-Cons have their own internal batteries and draw much less power than the main unit, that's not much of a surprise. Lastly, when undocked, discharged, and connected to the AC adapter, the Switch drew 16.1W total. With the JoyCons attached, that figure rose to 17.7W, which is very close to the 18W limit stamped onto the Switch's dock. The Switch also drew 9.8W when undocked, asleep, and charging, and 12.1W in that condition with the Joy-Cons attached. These figures again confirm that the Switch will charge considerably faster when asleep. With all of the above facts and figures in mind, it's finally possible to address one of the main questions people have with regard to powering Nintedo's latest console: can the Switch be charged through a USB power bank? The short answer is yes, but not just any power bank. Regardless of the Switch's current battery level, it can only pull about 9.1W from a power bank — a figure marginally over the 8.9W undocked performance figure established earlier, likely to account for system performance with the brightness turned all the way up and both Joy-Cons attached. Though many power banks can provide that sort of juice, there are some caveats. Firstly, not all power banks can provide a consistent 9.1 watts. Hooking the Switch up to the small, common sort of USB battery packs people have lying around simply won't provide enough power to run the Switch, let alone charge it. Secondly, even with some of the biggest and baddest 5V-capable battery banks on the market, the Switch will only ever draw a maximum of 9.1W. In a nutshell, this means the Switch will only ever run itself on a USB power bank — it simply can't draw enough power to both run itself and charge itself simultaneously. With that said, this cloud does have a silver lining: with the proper power bank, the Switch should theorically be able to pull enough power to run itself for reasonable amount of time. Also, the 9.1W maximum for power packs is reasonably close to the 9.8W usage when undocked, asleep, and charging, meaning a proper power bank could fully charge the Switch in nearly the same amount of time as the official AC adapter. With all of the aforementioned information in mind, players can finally decide what sort of options they have for keeping their Switch powered-up. Seeing as how the Switch charges through a USB-C adapter, essentially any USB-C power adapter should work with the unit. This means that third-party adapters should work just fine — and this includes the type of Apple power adapters that many people have lying around their homes. In regard to cables, essentially any USB-C cable will work. The 2.0 and 3.1 variants don't really make for any considerable differences in regard to utility, so long as they are up to standard specifications — meaning players will want to avoid third-party cables that are billed as "thin" or "flexible," as these cables often forego the thicker high-speed lanes needed to provide proper power to the Switch. As for Switch-compatible USB power banks, there are many suited to the task at hand. The Switch is limited to pulling just 2 amps power, which is a fairly standard figure among most newer USB power banks on the market. The Switch's internal battery is is rated at 4,310 mAh, meaning that users wishing to provide the Switch with at least one full charge should look for a power pack offering at least around 6,600mAh capacity. Keep in mind that any power bank working at 5V will max out at 10W before any cable losses, and the Switch can only draw at maximum 9.1W, so just about any power bank on the market will be insufficient to both run the Switch and charge the Switch simultaneously. All things considered, about any sizeable USB power bank on the market should provide a reasonable amount of play time or at least a single full charge. With those limitations in mind, players likely won't go wrong with the likes of an Anker PowerCore+ 20100, a ZeroLemon ToughJuice 30000, or RAVPower 20100 power pack. With a proper USB-C cable, players should be able to squeeze a single charge and perhaps some extra play time even out of more budget-oriented chargers, like the $24 Anker Powercore 10000 or even the $10 Lumsing Grand A2.